Studex Sensitive hypoallergenic surgical steel daisy stud earrings. 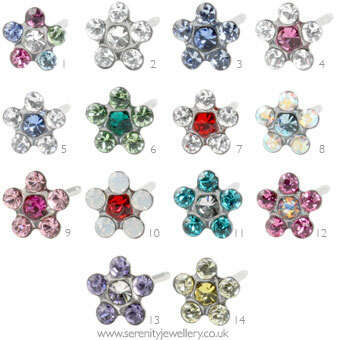 The 5mm flower design is inset with six crystals. These earrings come with surgical steel butterfly backs. I have previously purchased earrings for my daughter from this website and definitely will again. It's the only website I found with such a good selection of neat little studs as my daughter is only 9 and I hate dangly earrings in little girls. They are also hypo allergenic and so don't irritate her ears. She's had many comments on how cute and pretty thy are. 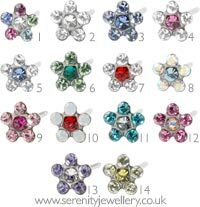 I am never disappointed with serenity jewellery, and these are really lovely. I got the rainbow cystals, and for the price they are amazing value. They look like much more expensive earrings. They are good quality too. Brought these for my daughter as a birthday present and she absolutely loved them, stunning pair of little earrings. My daughter loves these colourful earrings, perfect for sensitive ears. Lovely look and great size. Really love these flower earrings, they are a great size and could be worn alone or with a combination of other earrings, I currently have them in my 2nd lobe piercings. I put these in nearly-healed holes about 4 weeks ago and have had no problems at all. Great quality and good price. Really hard to find nice looking surgical steel earrings! These are really pretty earrings but unfortunately the earring posts are too short once the butterfly backs are on for my daughter earlobes. 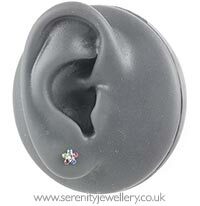 For anyone who finds standard length posts a bit too short/tight we do have a selection of earrings with longer posts. Great for our five year old, when she seemed to be allergic to the piercing studs. Thank you!